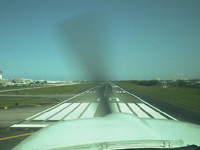 I departed beautiful Barbados midmorning on Sunday, October 25 for the relatively short hop to San Juan, Puerto Rico. The selection of San Juan as my next stop was frankly motivated by a real concern about possible problems with US Customs officials that I might encounter if I were to instead enter the US at a different port of entry. As a result of the country's ongoing war on illegal drugs, general aviation flights to the US from the South must, by law, clear customs at one of just a handful of specially designated airports, where drug sniffing dogs and DEA officials are at the ready to comb through the airplane. 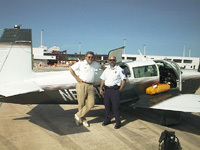 Aviation magazines and pilot chat groups are loaded with horror stories of storm trooper tactics employed by overzealous Customs and DEA officials, who supposedly leave it up to the innocent pilot and/or owner to figure out how, and how to pay for, putting the aircraft back into airworthy condition following their "inspection." Given my two month trek through 15 countries, 13 of which fit the definition of Third World, I was sincerely concerned that my trip profile might well provoke just such an official response. After discussion with a number of ferry pilots and various professional flight planners, I decided to clear customs in San Juan, which is a legal port of entry, but which has the reputation of having "kinder and gentler" customs officials. The departure from Barbados was into a bright, partly cloudy, blue sky. The airport is on the South side of the island, and I took off in an easterly direction, with a subsequent left turn and a climbout over the center of the island to the Northwest. Barbados is small enough that I could see the entire island by the time I reached just 2,000 feet. I was surprised at how small it looked! Small maybe, but lovely nonetheless. I had really enjoyed my brief visit and vowed to return again soon. The flight to San Juan took me over several islands of the West Indies, all of which offered lush aerial views. Over one of those islands (I can't remember which one) I began picking up considerable audio "hash" in several of my communications and navigation radios. Thinking it to be caused by some nearby high powered military transmissions, I inquired of ATC about the source of the interference, but the controller pleaded ignorance. After crossing that particular island the noise completely disappeared (and has never been heard in the Mooney since), so I'm convinced that the cause was some unidentified ground based source. Curious! Puerto Rico is quite a picturesque island unto itself. My flight path brought me into San Juan International Airport from the East along the northern shore of the island, and gave me a great view of the rising, green terrain to the South. The approach and tower controllers gave me the first taste of accent-less English that I'd heard in almost two months, and it was comforting to again be able to understand every word being said to me! The approach and landing were uneventful, with engine shut down occurring just 4.1 hours after starting up in Barbados that morning. Then I waited. A number of trips between the US and Canada over the years had taught me that, unlike the procedures in every other country of which I'm aware, US Customs officials will not allow you to open your aircraft door and step to the ground upon arrival unless one of their inspectors is present at plane side. No one came, and after a few minutes the cockpit was heating up under the hot Puerto Rican sun. I called the ground controller on the radio for suggestions, and he said Customs was aware of my arrival. Before I could inquire as to the potential length of the wait, an elderly gentleman drove up in a pickup truck painted with official airport markings on the side. He got out of the truck and walked over to talk with me through the small open pilot's window. He asked, first in Spanish and then in broken English about landing and parking fees, which he'd been dispatched to collect from me. When I protested that I couldn't pay him until I'd been properly cleared by Customs, he motioned over to an unmarked door along the side of the terminal building (which was under construction and surrounded by workmen and piles of building materials) and tried to explain to me in a heavy accent that I should just walk over to the door and go in to meet with Customs. This was new to me, and I was paranoid about breaking some old hard and fast rule about dismounting my aerial steed before I'd received the appropriate Federal blessing. He insisted that this is what everyone did, but I stalled for a few minutes until I saw another airplane taxi up and disgorge its crew, who themselves marched casually over to and through the door. OK, I thought. At least I'll have company in jail! I stepped down onto American soil for the first time in many weeks, and after collecting my briefcase, passport, wallet, flight plan, and every other official piece of paper that I could think of, walked over to the nondescript door. Sure enough, on the other side was a typical, airline style Customs lobby, with inspectors sitting in booths ready for arriving passengers. Even though I was still wearing the pilot uniform and photo ID badge that had so swiftly carried me past such official stanchions in the other countries I'd just visited, I nervously walked up, presented my passport, and waited for the "you know what" to hit the fan. But nothing of the kind happened! Quite to the contrary, I was very warmly and courteously greeted, whisked through the short Q & A that we all expect to get when entering the country even as just a passenger, got my passport stamped and my airplane's annual customs sticker renewed, and was on my way back out to the ramp with a friendly inspector at my side to check out the airplane. He quickly looked through the main door and baggage hatch, asked me a few perfunctory questions, and then began informally chatting with me about my trip. That was it! Ten minutes after walking into what I feared would be a replay of the Spanish Inquisition, I was on my way unscathed. Whew! Maybe those horror stories in the magazines and hangar talking sessions were nothing but the figment of some overactive aviators' imaginations. In any case, I called the flight planning department at Jeppesen to advise them of my very efficient and courteous treatment in San Juan, so that they could pass on that good news to their other clients. The view over the nose at San Juan, Puerto Rico just before touching down on American soil for the first time after flying around the world! Posing with the US Customs inspector who greeted me upon my arrival in Puerto Rico. I'm convinced his scowl was for the benefit of the camera. He was really a very nice guy!